In addition to the increase in lobbying and money lavished on California lawmakers as they were preparing to vote on a bill to limit Pacific, Gas & Electric’s financial liability in the California wildfires, PG&E has also stepped up its advertising, focusing on all they are doing to prevent future wildfires by cutting trees and bushes around power lines, and cleaning out brush. They are advertising on radio and television about how the company is setting up special services to deal with weather forecasting and first-responder communications. It surely makes many wonder why California lawmakers would try so hard to pin PG&E with the blame for the wildfires. But this article isn’t about that… the next one is. In the midst of PG&E dealing with a crisis of being blamed for the wildfires, and the State Legislature and Gov. 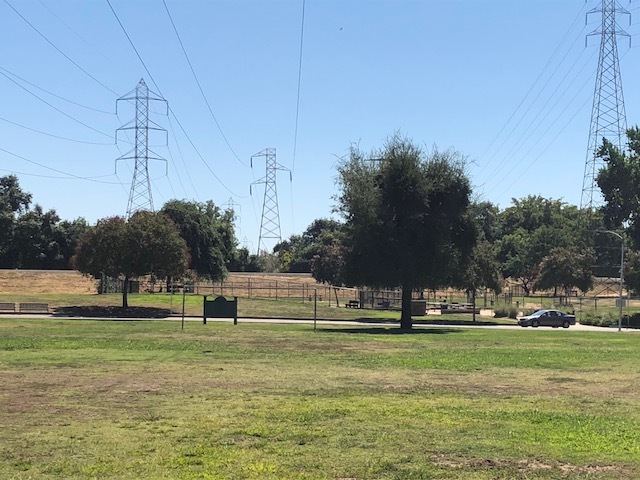 Brown passing legislation to reduce PG&E’s legal responsibility for wildfire damages, some residents are aghast at the aggressive clear cutting being done at a local park which borders on a residential Sacramento neighborhood. But this tree-cutting isn’t a new thing; it’s been going on since 2015, with little or no notice to homeowners. 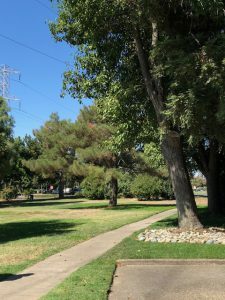 University Park is just off of one of Sacramento’s major artery streets, Howe Avenue, parts of which border the American River. Also along Howe Avenue are giant PG&E Electric Transmission towers, most of which tower at 250 feet high. The south end of Howe Avenue turns into Power Inn Road… named for obvious reasons with the transmission towers running for miles north and south all along the corridor. Interestingly, the same aggressive tree-cutting is happening in Lafayette, CA: Hundreds of trees in Lafayette, including some along the Lafayette-Moraga Trail, are slated to be cut down as part of PG&E’s Community Pipeline Safety Initiative, the East Bay Times reported. This is almost the verbatim problem and discussion I recently had with Sacramento residents Jeff and Jan Float. Their home borders the University Park, is across the street from the dog park (also slated for tree removal), as well as the University Office Park next door. 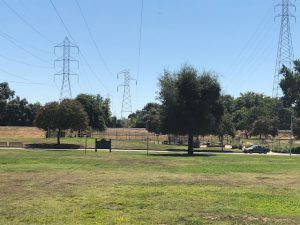 When I met with Jeff and Jan Float, they took me on a walk throughout the area, showing me the spray paint marks on trees slated for removal, and how the entire area would be devoid of trees. 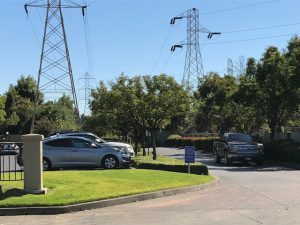 Trees were on private property, as well as in the park, and they said all of the Crepe Myrtle trees in the office building parking lot are slated for removal, amounting to a clear cutting of the entire area. I took numerous photos, included in this report. 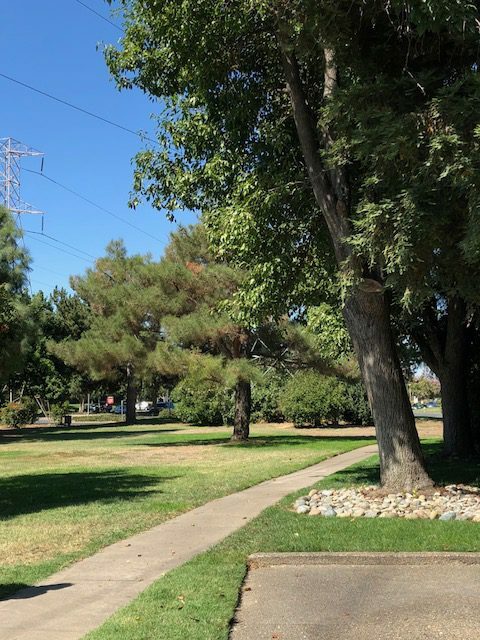 It’s also important to note that homes on tree-lined streets are desirable and buyers pay more for them, as well as homes bordering parks and greenbelts. These economic realities are apparently of no concern to PG&E. 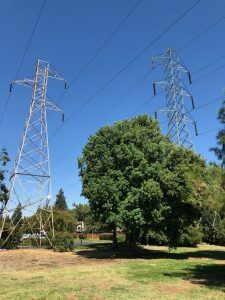 I contacted Brandy Merlo with PG&E, to ask why the aggressive tree removal in a residential area is necessary. 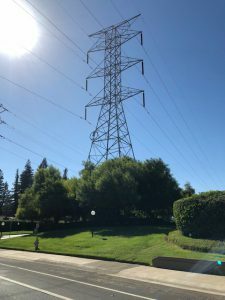 She initially gave me the usual spiel about high voltage electrical transmission lines, and their right to remove trees “within their right-of-way”… However, she said PG&E is in the “information and reach-out phase” with these homeowners, and that no cutting is being done yet. Brandi said they are working with certified Arborists to determine hazards to their transmission lines, and identifying trees for removal. Jan Float said PG&E’s “reach-out” is to knock on the homeowner’s door at 7:00 in the morning the day of the cutting, to let the homeowner know their trees are coming down. I asked Brandi if this clear cutting is aggressive for an area that is not subject to wildfires. She quickly said this work “is not wildfire related,” and said it is all about the safety and security of electricity transmission. 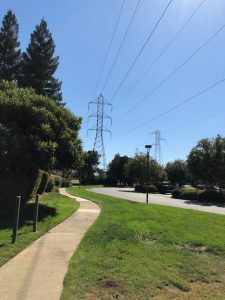 Additionally, she explained that PG&E is under federal guidelines and referred me to the 2007 Federal Energy Regulatory Commission (FERC)/North American Electric Reliability Corporation (NERC) legislation mandating zero vegetation outages in areas of 200KV lines and higher. Brando said the goal of PG&E is to “remove threats in our right-of-way for first responders and our employees.” I thought this was interesting, since it’s the same reason given to the Lafayette neighborhood. I took pictures of the area and questioned the thinking behind removing low crepe myrtle trees and even lower bushes in the parking lot and the park, and wondered how low trees and bushes could be a problem for first responders. I told her that I was told by homeowners the entire park and dog park were slated for complete tree and bush removal. 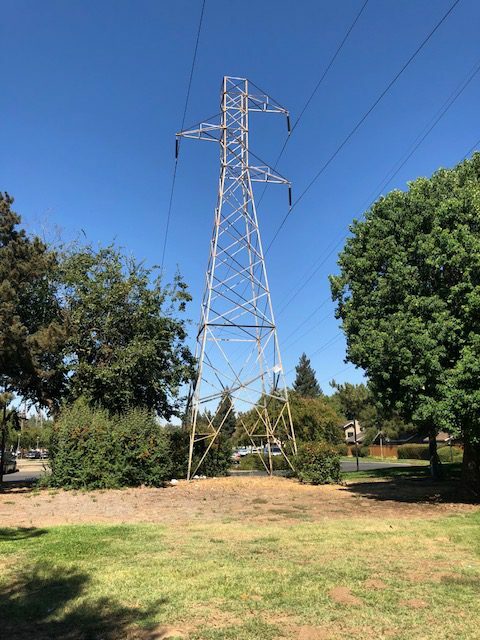 They also say that most easement agreements do not give PG&E permission to cut trees, and therefore, PG&E has no legal right to do so on private property. But homeowners are feeling bullied, and that their options are dwindling. Lastly, Save Lafayette Trees added, “there is no data to support that cutting trees increases safety,” and that PG&E should instead be installing automated or remote shut-off valves and implementation of the gold-standard internal “smart pig” inspections, both methods proven to be beneficial to pipeline integrity in HCAs (High Consequence Areas). This tree removal seems antagonistic, and contrary to actual fire prevention measures, in town, or in wildfire prone areas. To that end, I recently wrote about about really important wildfire legislation Jerry Brown vetoed in 2016; a bipartisan bill which would have given local governments more say in fire-prevention efforts through the Public Utilities Commission proceeding making maps of fire hazard areas around utility lines. I’m still astounded he did this, and place much of the blame of this years’ wildfires on him because of his political veto. Imagine the damage that could have been averted — and lives saved — if the state had replaced the antiques earlier and cleared millions of dead trees in lieu of building the train whose costs are careening toward $100 billion and may never be finished. But instead of examining their own priorities, the state’s politicians will blame the damaging fires on climate change and Donald Trump. California’s Democrats would rather burn down their own state, than admit they are wrong. These homeowners hope cooler heads will prevail. This entry was posted on Friday, October 5th, 2018 at 1:03 am and is filed under Blog Posts.